The only reason John David and I went across the sand dunes this year was because recent rains had created an impassable swamp on one of our usual trails through the woods in northern Michigan. Much to our surprise, however, the dunes were full of mushrooms, including Russula ventricosipes, Laccaria trullissata, and an unnamed Amanita I have called the Sand Dune Amanita. But the most curious sand-dune mushroom of the lot was Scleroderma septentrionale. Like other species of Scleroderma, this mushroom is a puffball with thick rhizomorphs at its base, filled with blackish spore dust at maturity. 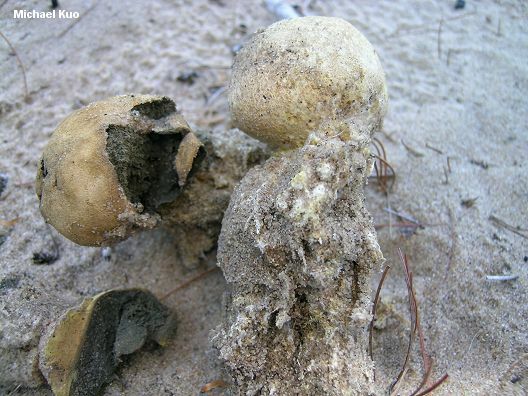 Many Scleroderma fruitbodies are partially submerged in soil when they begin to develop, pushing themselves upwards as they mature in order to distribute airborne spores. However, because of its habitat in sand dunes, Scleroderma septentrionale must thrust its spore-filled ball very high into the air to compensate for shifting, wind-blown sands. Thus the rhizomorphs are bundled together and interlaced with sand to create a sort of "stem" that can reach over 10 cm in length. Scleroderma meridionale is nearly identical to Scleroderma septentrionale; see the comments below for help separating the two species. Scleroderma macrorrhizon is a synonym for the combination of Scleroderma septentrionale and Scleroderma meridionale (below). Ecology: Perhaps mycorrhizal with hardwoods and/or conifers, but possibly saprobic, since it is usually found far from trees (the mushrooms I collected were in a sand dune about 20 yards from a stand of Eastern White Pine); growing scattered or gregariously in sand or sand dunes; widely distributed in northern North America from Oregon to Massachusetts; summer and fall. Fruiting Body: 2.5-6 cm across; with a more or less round structure sitting atop a well defined "stem" measuring 5-10 cm long and composed of bundled, whitish rhizomorphs that extend underground; surface yellowish and often mottled, smooth or with small and irregular scales that tend to be concentrated near the apex; bruising dark reddish; skin 1-3 mm thick; developing irregular tears and holes at maturity, sometimes with sections peeling outwards (vaguely reminiscent of Geastrum). Spore Mass: Fleshy and white at first, becoming purplish brown, then black and dust-like. Chemical Reactions: KOH on surface dark reddish brown. 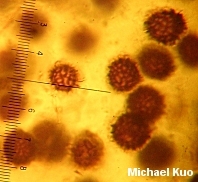 Microscopic Features: Spores 8-16 µ; round or nearly so; densely spiny and reticulate, with spines 2-4 µ (or more) long. REFERENCES: Jeppson, 1998. (Guzmán, 1970; Smith, Smith & Weber, 1981; Sims, Watling & Jeffries, 1995; Guzmán & Ovrebo, 2000.) Herb. Kuo 09120414.